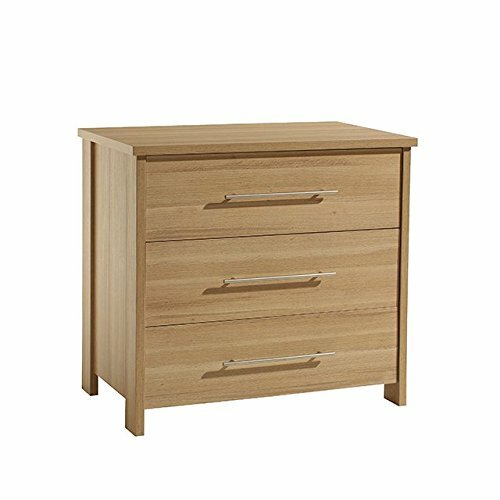 Timelessly simple and sophisticated is the Oakland Dresser for parents who value both design and spacious furniture. It is uniquely structured to be a perfect balance between modern and ageless tradition. Its distinctive silver railing handles perfectly match the oak color scheme which creates a polished and harmonious feel for the piece. Three spacious drawers cater to all your storing needs. With clean and multitoned wooden lines, it flows right into the room and creates a calm and cozy setting for you and your little one. The Oakland Collection’s style is universal which makes it perfect for both boys and girls. Its neutral wooden tones make it easy to pair with other colors and décor pieces, but it looks especially impeccable alongside the Oakland Convertible 3-in-1 Crib!